The preliminary round of Philly’s Phunniest competition resumed this past weekend at Helium after a holiday hiatus the week prior. Of the comics performing this past week, Roger Weaver, Pat House, Brendan Kennedy and Doogie Horner move on to round two. Congratulations! Preliminaries continue this Sunday, where over a dozen comics look to snag a spot moving forward, with Sydney Gantt, Chris Cotton and Billy Bob Thompson among them. 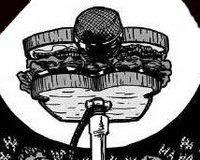 Every month, the PHILADELPHIA JOKE INITIATIVE presents OPEN MIC SANDWICH. The free show, hosted by TOMMY HIGHLAND, features an hour of open mic surrounded by full sets from established comics. Performers this month include CHRIS COTTON & AARON HERTZOG. Be sure to get there early tomorrow night to sign up! Philadelphia’s only live talk show explores the successes and failures of some of the city’s funniest comedians. This month Kent welcomes Steve Gerben and sketch group Secret Pants. The show that takes care to select only the worst of screenplays, shorts and various written fodder, and pairs them with only the best comedic talent. Brendan has his tongue planted so firmly in cheek with this show, it’ll make your cheeks hurt too. This month’s parts will be played by Chris Cotton, Roger C Snair, Richie Redding and Sidney Gantt. 8PM – WHY AM I NOT FAMOUS?! ?